If you’re thinking about running, don’t start thinking about a marathon, start with thinking about a run around the park and if you find its OK, build up slowly and at your own pace to whatever you feel happy with – slow as you like. The journey will help you understand your own patterns and what works for you to be running with BAD. The following pages outline what we have learnt over the years (and many false starts) so we hope you might find something useful in here to be more active outside, be that walking, cycling or skateboarding. Not quite true, you have unlearnt how to run, you ran as a child and you can learn again. The tricky bit is that this first part is hard, the hardest part of all – by a LONG way. No one goes from non-runner to runner straight away (unless you happen to still be young). A run/walk system is the way to go, an approach which moves from largely walking to largely running over a number of weeks. The best advice is to find a Couch to 5K (C25K) group which are available all over the country or the NHS have an app so you can do it on your own phone. Over 10 weeks you can build up to 5k on just 3 short run/walks a week. BAD-UK has a page on STRAVA (a free app for runners and cyclists) so everyone with BAD who runs, cycles or swims can share their routes, ideas and give KUDOS to everyone as they get outside and take back control from their BAD. Planning is the key here. Toilet routes: One option is to plan out routes based on available toilets as chances are you won’t need one at all, but most of us like the reassurance. Use ‘toilet finder’ for public and RADAR toilets for cafes, pubs, McDonalds etc all count - and don’t forget to map in around friends or family houses. I always take two £1 coins with me so if I need (or feel I need) to buy a bottle of water in exchange for using the loo, then I can. Honestly, I have rarely ever needed to as most shop owners are quite happy, but again its saves any worry. Don’t forget your RADAR key, many public toilets which are locked have a RADAR option! Offroad and trails: Obviously, you may (like most runners) have times when you want to go off the main roads or town centre or wherever your usual toilet route goes (mine is a ring road and man, it is dull). This is fantastic as going off-road will give you the full benefit of fresh air and nature and it can give you a real surge of contentment and get rid of those stresses. In this case, take a small pack of kit in a pouch– my choices: wet toilet paper, resealable food bags or doggy poo bags (for the toilet paper), antibac handwash and water bottle. Then, choose a route with large parks or countryside where there are lots of bushes or trees etc. where you can go and clean up in private and just pop the bags in a dog bin when you leave. Another option according to Google in the USA is taking a small trowel and dig a hole or cover it over but who carries a small trowel? Parks and parkrun: Other good options are to find parks which have toilets and run around them, so you are never too far away but it’s a nicer surrounding. You may have heard of parkrun, a 5k jog, run or walk at 9am on Saturday morning all around the UK and now the world. We go every week to local ones and it’s a great way to get moving with lots of others and its OK to walk the whole way – and having one with multiple loops past the toilet is a winner in the world of BAD! On this link it will show you your local parkruns, you register, print your barcode, turn up and go (they all do a briefing for first timers every week about 5 min before the start). This is about telling the difference between true physical exhaustion and mental tiredness. Most of the time, if you went for a walk outside for 10 minutes or your best friend came round, you would feel brighter. Running is a bit of a contradictory activity – you would think it tires you out, but if you do just enough and not too much, it will properly perk you up for hours. The reason many people don’t feel this when they run is because they are not active regularly so every time its tough as the body is always starting from scratch OR (and I find this is particularly for the more competitive types) is going TOO FAST or too far when running. This is exhausting as you’re doing too much. Sometimes, I just put on my trainers and go for a gentle jog with lots of walking just around the block, whatever I might think I ‘should’ do. If that’s all you fancy then that’s fine – whose counting? Rest is fine: Clearly there are times when the body is not well or thoroughly exhausted and rest is the only thing you should do – that’s OK too, try and get out tomorrow, even if its for 10 minutes. To get good at running you should aim for 3-4 times a week so that 3-4 rest days each week as standard. I ran the London Marathon after training only twice a week as it was all I could muster. Worried you won’t make it: At times, I have been a little unsure if I was going to ‘make it’ on a longer run – and then I take a bus pass, some change or even a bank card, and then follow a bus route so I can just jump on a bus back to near my house. Timing of Meals: An important thing here is about the timing of eating in relation to running. I have found it best to not run within 2-3 hours of eating anything resembling a meal, or (if you tend to have issues in the morning) first thing. It is likely that lunchtime or early evening, before eating, will work best as a general rule, although obviously you will know your patterns best. Drinking and dehydration: A critical element to us BADders is avoiding dehydration, but also drinking the right things. Running causes depletion in both water but also electrolytes, as does our severe diarrhoea, so you will quickly become exhausted and quite unwell if you do not take on the right stuff on a run. Although water is generally great, it does not replenish those electrolytes so its important you take on a drink (or gel) which has those elements. For short runs, I like coconut water, smartwater or lucozade without sugar, but for longer runs its worth getting the right types of sports drinks and other things like gels or special sweets. I often again take a £1 coin (or even a £5 note) so I can stop and get a drink en route and not carry it all with me. · Breakfast – porridge with low fat soya milk, a little golden syrup and banana. · Dinner – pasta with a homemade plain tomato sauce including garlic and basil – usually with some quorn meatballs. No cheese, no meat. All marathon runners are advised to cut down fibre from fruit and veg to reduce the speed of transit for at least 2 days before and this is great advice but there is no need for most running. Generally, BADders find it really important to cut down fat and it becomes even more so for intense activities, so an average 20g a day in the day or two before can be helpful. Another general rule for long distance runners, which again is even more important to us, is to cut down or out meat as it sits around longer in the stomach and has no value to running. This, by experience, might increase the bloating a little but slows down the trips to the loo and things are otherwise very settled. Keeping it regular: Everyone is a little different, but generally the advice would be to take the binders as usual throughout any change in activity or in the lead up to an event - don’t change anything unless you have tried it a few times in training. It might seem like a good idea when you are getting nervy or worried it might all go badly, but try and resist, as your body is used to its daily routine and changes may unsettle it. Many runners with BAD have some other medications and they report they just keep it the same throughout any training. Other medications: Personally, in the lead up to a long race I used to take domperidone (used to be packaged as Motilium) in the carbo-loading days as this reduces the bloating and stops me getting uncomfortable – this is now prescription only but good to ask your pharmacist for other bloating reducing options (like activated charcoal). Imodium is also my good marathon friend, but only one on the morning of the long runs as its just a little extra help, a small tweak not a large one. You should not take ibuprofen (or similar) if you are distance running, so we swap to Paracetemol based products to manage any pain. Many regular runners pick one or two races per year that they will train up to, be that a 10k or a marathon. This is a problem for those of us with BAD as that might put too much pressure on ourselves. It would be so disappointing to train like crazy and then be unwell and all that training would go to waste. Training Plans: Most people just run to keep fit and don’t train using a ‘training plan’, just doing what they feel like. If you do use a plan, then keep it really flexible, and keep to its principles – so for long distance this would in a week something like: one long run, one fast short run and one slow mid-distance run with maybe one short slow run too. Then you can just move it around suit how you feel and dropping a run or two is no big deal as long as you do that type the following week (and drop a different one). Choosing a race: Other things if you do want to do a particular run away from home, is to book hotels with free cancellation; choose a race where you can defer to next year or move the place to another race or get a refund OR just go and cheer on your new running friends. This means that if you are not well enough, you haven’t lost too much. I always have a Plan B, if Plan A race doesn’t work out, so maybe a week or two later have another one in mind. You may also want to check the race is large enough to have portaloos on the course by looking at last year’s race route. Group runs: Another tricky area is group runs as you might feel you are letting people down if you don’t make it on time. We do parkrun every week, and this is great as its such a good atmosphere and meet up with friends, but if we don’t make it in time then its fine as everyone will run on time with or without us. You may want to arrange to attend runs groups which will happen regardless of whether you make it. I don’t offer to lead or organise the runs without a deputy and will join friends on a run but don’t plan it as a definite. There will be running and jogging clubs near you (if you happen to live near Nottingham there are LOADS) who meet at points and run with whoever makes it. If I don’t make it, I plug into my audiobook and go out on my own and enjoy my own company. I then compare our runs on Strava with my friends as if I was there. Raising Money: This is often a motivator to push yourself out the door, but it can also be stressful so be sure that you give yourself a Plan B if Plan A just won’t work out. Lining up a replacement race or just doing the distance around your home town is enough, no-one will ask for their money back!BAD-UK have running vests which you can have free to raise awareness of the condition or if you might like to raise money for their work (just email the charity). Hmm, we would be lying if we said we had never had a bad run or some mistakes hadn’t happened. Bad days happen and frequent rushing off to the bushes or stopping at every portaloo on a race has happened to us all at some point and it is thoroughly exhausting. But its not that common and although us runners can tell you about these difficult runs these probably only make up less than 5% of all our runs and that’s pretty good going! Some of us have moved to a greater proportion of cycling or swimming as its less troublesome, but its important to find what works for you but also gives you all the benefits that you want from it – you won’t do it unless you enjoy it. This section was written by Karen with input from Maria who tell a little of their story of BAD and why they run. Karen says “I’m 44 years old and diagnosed via the SehCat scan with severe BAD in 2016 after nearly 3 decades of symptoms which had becoming progressively worse resulting in repeated hospitalisations. I started running at around age 30 as part of charity fundraising and found it lifted my spirits when things were tough. It was very difficult to maintain any regularity, with days, weeks and months off due to being so poorly and extreme exhaustion but it was possible to do it and I used to tell myself that unless I physically could not get up, then I would get my trainers on and get out that door, even if I only made it the end of the road. And sometimes that’s as far as I got. But usually I made it round the block or even round the park, even running 3 marathons during those latter pre-diagnosis years. I have never been a quick runner and have always been in a back end of any group but since my diagnosis and taking regular binders, I have been able to run consistently, averaging 3-4 times a week with occasionally needing a few days off and have smashed every PB. I think my activity really helps the BAD, as it keeps all of me at my most healthy, keeps my spirits high (especially when a new PB falls! ), including reducing stress, keeping weight at normal levels and my stomach and bowels regular. It has also introduced me to a world of fellow runners, who understand my condition and are quite happy to chat or do an extra loop while I go off to the loo – its never been an issue”. Maria says “I’m 54 years old and was diagnosed with Moderate BAD in 2016 via the SehCat scan. My symptoms are severe watery diarrhoea, and phases of very bad wind but I rarely get bloating and don’t feel unwell in general but I find that Stress is major factor in my symptoms. I’m naturally slim so I’m one of the lucky ones. I’ve been vegan for several years and vegetarian since I was in my teens. I’ve experimented with the low FODMAP diet and gluten free to no avail. I am currently experimenting with very low fat and lots of probiotics and I’m addicted to sauerkraut and kimchi. I tried the medication, but it made me feel so sick all the time, gave me wind, a bad taste in my mouth and severe bloating so now I don’t use the medication at all. 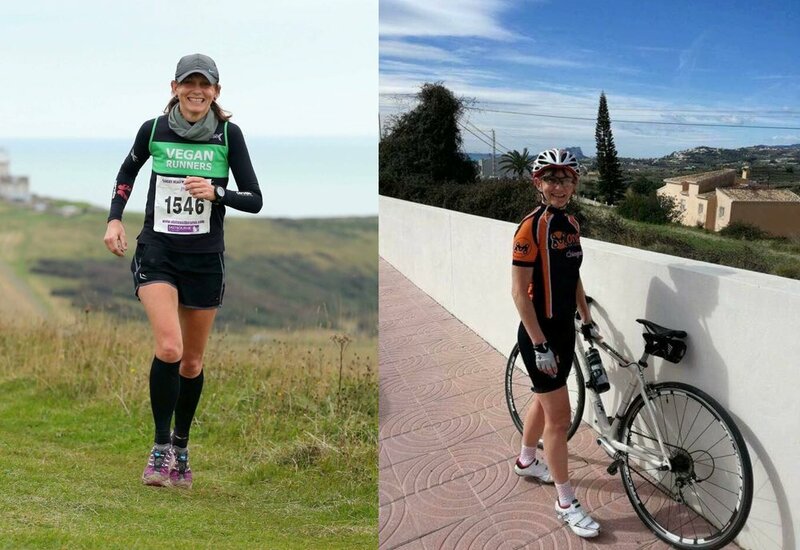 I started running when I was 40 – the mid-life crisis thing. That was when I realised that having constant diarrhoea wasn’t a normal thing, but it took 12 years to get diagnosis. Aged 45 I ran my first marathon. I had a fantastic time (only stopping about 3 or 4 times for emergency loo stops) and was hooked. I love the outdoors, running in nature, the camaraderie. I’ve run over 150 marathons now including about 30 ultra-marathons, the longest distance being 100km.